The global spiral membrane market was valued at US$ 4650 Mn in 2017 and is anticipated to expand at a CAGR of around 10.58% from 2018 to 2026, according to a new report titled ‘Spiral Membrane Market: Global Industry Analysis, Size, Share, Growth, Trends, and Forecast, 2018–2026,’ published by Transparency Market Research (TMR) Implementation of stringent regulatory and sustainability mandates for environmental safety is anticipated to propel the global spiral membrane market during the forecast period. Stringent regulations have increased demand for water purification and wastewater treatment across the globe. Environmental regulatory acts, such as the Clean Water Act (CWA) and Safe Drinking Water Act (SDWA) have enforced stringent rules and guidelines for eliminating the release of high amounts of toxic effluents into water sources. These regulations ensure that high quality standards are followed for water & wastewater treatment. Spiral membrane are used to maintain these standards. This, in turn, is driving the demand for these membranes. Freshwater regulations worldwide are becoming more stringent. Governments are pursuing a variety of regulatory approaches for reducing water pollution, as water quality is largely affecting public health and the ecosystem. Regulatory techniques include tighter discharge limits for pollutants and nutrients, mandating technology requirements, water use restrictions, and effluent rights trading. Freshwater reserves are not uniformly distributed across the globe. A number of regions are experiencing chronic freshwater shortage. Less than 1% of the world’s freshwater is readily accessible and located in lakes, rivers, and streams that across continents. Freshwater is a finite resource as the water cycle is constantly renewing itself. The Middle East, North Africa, and Southwestern U.S face water shortage problems. Shortage of water is increasing in places that have access to large amounts of water. China is facing severe surface and groundwater water supply problems, as it irrigates croplands to feed its enormous population. India and Thailand depend on monsoon for fresh water. Lack of rainfall in these countries is drying up rivers such as the Ganges and Chao Phraya. The Pacific Northwest of the U.S., known for its wet weather, and states from Maine to Georgia experienced drought in the last few year. These factors have increased the demand for water and wastewater treatment across the globe. This, in turn is projected to drive the global spiral membrane market. High costs of equipment used to manufacture spiral membranes is a major factor that is expected to inhibit the spiral membranes market. Moreover, the spiral membrane manufacturing process is capital intensive. End-user industries that use spiral membranes include waste & wastewater treatment, food & beverage, and oil & gas. These industries require high maintenance for removing fouling & foulants, pretreatment, and cleaning of the spiral membrane. Removal of foulants from the membrane scale is accomplished by cleaning it with organic acids such as citric or sulfamic acid. Based on type, the global spiral membrane market has been segmented into polyamide, PS & PES, fluoropolymers, and others. In terms of revenue, the polyamide segment accounted for a dominant share of the global spiral membrane market in 2017. Polyamide is projected to expand at rapid pace during the forecast period due to its easy availability and cost-efficiency. The PS & PES segment accounted for a large share of the market. PS & PES imparts strength and high resistance to oxidation and are mostly used in ultrafiltration, and microfiltration. The fluoropolymers segment constituted a moderate share of the market in 2017. Fluoropolymers have high dissipation factor; therefore, these are not employed in spiral membrane. 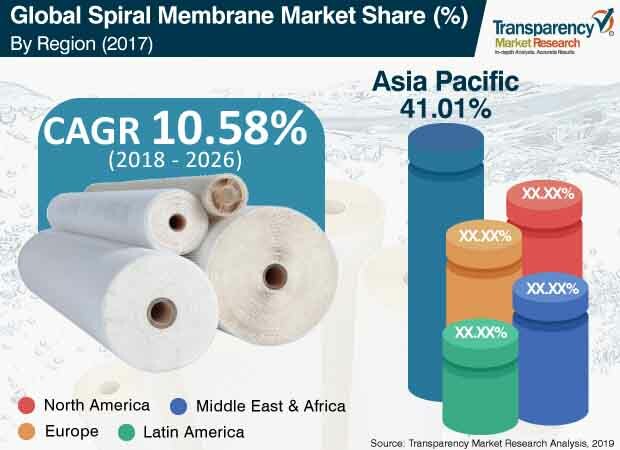 Based on technology, the global spiral membrane market has been segmented into reverse osmosis (RO), nanofiltration (NF), ultrafiltration (UF), and microfiltration (MF). In terms of value, RO is a leading segment of the global spiral membrane market and is likely to continue to dominate the market during the forecast period, as it is cost-effectiveness. The NF segment is anticipated to expand rapid pace during the forecast period due to the increase in its use in water treatment applications. The MF segment constitutes a large share of the global market. UF is anticipated to be a less attractive segment during the forecast period, as this technology cannot separate dissolved salts. In terms of end-use industry, the global spiral membrane market has been divided into water & wastewater treatment, food & beverage, pharmaceutical & biotechnology, chemical & petrochemical, oil & gas, and others. The water & wastewater treatment segment is sub-segmented into desalination, public, utility water treatment, and wastewater recycle. In terms of revenue, the water & wastewater treatment segment accounted for a dominant share of the global market in 2017. Rapid growth in population and urbanization is increasing the demand for clean water. The food & beverage segment constituted a large share of the market in 2017. The segment is projected to expand at a rapid pace during the forecast period. Pharmaceutical & biotechnology and chemical & petrochemical segments accounted for a considerable share of the market in 2017. Pharmaceutical companies use spiral membrane to produce simple chemical synthesis and complex drugs. Based on region, the global spiral membrane market can be classified into North America, Europe, Asia Pacific, Middle East & Africa, and Latin America. In terms of demand, Asia Pacific dominated the global spiral membrane market in 2017. In terms of value, Asia Pacific was a leading region of the global spiral membrane market in 2017. The region is estimated to continue to dominate the global market during the forecast period. The market in Asia Pacific is likely to expand at a rapid pace during the forecast period due to the presence of a large industrial base and increase in demand for spiral membranes in water & wastewater treatment, chemical & petrochemical, and other industries. Europe constituted moderate share of the spiral membrane market. According to the European Federation of Pharmaceutical Industries and Associations (EFPIA), the research-based pharmaceuticals industry is growing in Europe. This, in turn, is driving the spiral membrane market in the region. Middle East & Africa accounts for a considerable share of the spiral membrane. The market in the region is projected to expand at a significant pace during the forecast period due to the growth in the oil & gas sector in the region. Large multinational corporations with a strong brand presence account for a considerable share of the global spiral membrane market. Brand image and brand equity play a crucial role in the market. Key players operating in the market include BASF SE, Bayer AG, Syngenta, FMC Corporation, SUEZ, LG Chem, and ALFA LAVAL.